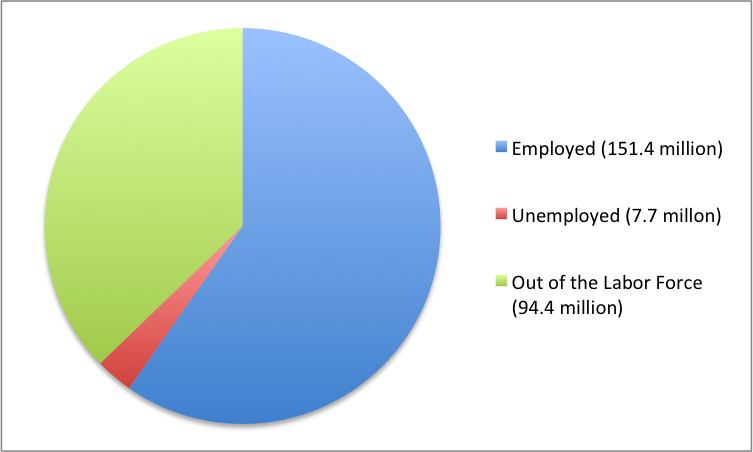 Unemployment is typically described in newspaper or television reports as a percentage or a rate. A report might say, for example, from January 2013 to December 2013, the U.S. unemployment rate dropped from 8.0% to 6.7%, and by the close of 2015, it had fallen to 5.0%. At a glance, the changes between the percentages may seem small. But remember that the U.S. economy has over 160 million adults who either have jobs or are looking for them. A rise or fall of just 0.1% in the unemployment rate of 160 million potential workers translates into 160,000 people, which is roughly the total population of a city like Syracuse, New York, Brownsville, Texas, or Pasadena, California. Large rises in the unemployment rate mean large numbers of job losses. The decrease in unemployment from 8% in 6.7% 2013 meant an additional 2.02 million people were employed who had previously been looking for work. The point is that the adult population is not just divided into employed and unemployed. A third group exists: people who do not have a job, and for some reason—retirement, looking after children, taking a voluntary break before a new job—are not interested in having a job, either. It also includes those who do want a job but have quit looking, often due to being discouraged by their inability to find suitable employment. Economists refer to this third group of those who are not working and not looking for work as out of the labor force.